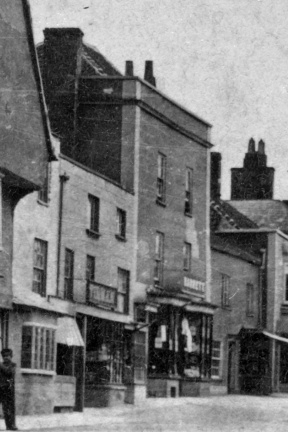 The two photographs above show the property we now know as 5 High Street, Thornbury. The photograph on the left above was taken in the late 1860’s when the property was known as ‘Barrett’s the drapers’. The photo on the right was taken in 2013 when the building was the Lloyds Bank. We haven’t seen the deeds for this building but we’ve been able to build up a reasonable picture of its history from a few indentures identified as being for it or for its neghbours. We were able to establish that the property was owned by John Rudge in the mid 1700’s and that had previously been known as the ‘Cooksey house’. The Overseers Account books have enabled to trace the Cookseys had followed Mary Martimore (or Mortimore) who was there in 1656. The Martimores (or Mortimores) – the overseers accounts in 1656 show that Mary Martimore widow was liable for the poor rate of 1d per month. The name of Martimore appears in the Thornbury parish records of the time, together with the alternative spelling of Mortimore. Mary was listed there until 1663 when the entry shows that ‘The heirs of Francis Martimore or Elizabeth Cooksey tenant’ was responsible for paying the 1d per month. We assume that Mary was the widow of Francis Mortimore a shoemaker who had died about 1646. His will was proved on 29th January 1647. Several family trees on the Internet show that Francis’s wife was Marie. We note that a transcription of a borough rent roll thought to be prepared around 1670 includes an entry for ‘William Martimore Cooksley house’ half a burgage. We don’t know the connection between William and Mary Martimore who had been listed earlier. He might be Mary’s son. We note that the Overseers Accounts show a William Martimore applied for help for several years from 1655 onwards. This accounts list this William as living in Morton. In 1655 he was given woollen cloth and linen cloth (valued at £1 6s 10d) to clothe his children ‘being very poore and in greate want’. In 1656 he was given 7 shillings each month and 3s 9d for cloth for Martimore’s children. In 1657 he was given 4s 6d for his son’s clothes. One explanation of the 1670 reference could be that William was one of the heirs of Francis Martimore and the Cooksleys were his tenants. The Cookseys – the 1663 Overseers accounts show Elizabeth Cooksey was the tenant of the heirs of Francis Martimore (or Mortimore). She was paying 1d per month in poor rate up to 1666 when the rate was increased to one and a half pence per month. Elizabeth was a widow who was listed in the property until 1690. We know from various records that the Cookseys were Quakers and the records of the Quakers that are held in Gloucester Archives show that Elizabeth Cooksey was one of a group of Quakers mentioned in a presentment of 1687 for non-payment of the church rate. We don’t have the overseers accounts from 1691 to 1706, but from 1707 to 1716 John Cooksey is listed as paying the one and a half pence per month in poor rate. From 1717 to 1737 Nathaniel Cooksey was paying the rate of one and half pennies each month. It appears that John Cooksey was a schoolmaster in 1685. The records of the Quakers show that there was a Friends’ School for both sexes in Thornbury in 1691. On 12th May 1678 John married Hannah Russell of Littleton. They had a son, John, born on 8th February 1680, a son, Nathaniel, born on 1st April 1682, 30th August 1686 Joseph and a second son called Joseph, who was born on 17th July 1706. John was buried on 3rd August 1716. The burial register notes ‘he was a publick friend of the Ministry and dyed about the 71 years of age’. Hannah died on 13th November 1726. Nathaniel married Hester Boy, the daughter of Francis Boy of Stidcott, Tytherington at Olveston on 2nd July 1707. Nathaniel and Hester had John born on 19th January 1708, Hannah born on 30th December 1711 and Sarah born on 4th March 1715 (who was buried on 5th April 1722 at Thornbury). Hester was buried in the Quaker burial ground in Thornbury on 28th May 1754. We have found one intriguing reference to Nathaniel. We do not know when it was written nor where we got it from, but it is clearly connected to the records of the Quakers. It says ‘We do appoint Thomas Sturge and John Ruston to go and talk to Nathaniel Cooksey about his disorderly living.’ We’d love to love more! We have been contacted by Pauline Williams who tells us that Nathaniel died on 17th June 1740 aged 62. He was living in London at this time in the parish of St Sepulchre’s and was buried in the Friends’ Burial Ground near Bunhill Fields in London. William Swanley – the Overseers Accounts from 1738 to 1746 show William Swanley as paying the poor rate of one and a half pence ‘for Cookseys’. We suspect that William was the one baptised at Thornbury on 4th June 1677, the son of William Swanley. William married Mary Pulling in Wickwar on 14th September 1708. John Rudge – the Overseers Accounts show that John was paying the poor rate of one and a half pence per month on the property ‘for Cookseys’ from 1747 onwards. From 1748 he also owned the adjoining property (7 High Street). We know from an indenture for the adjoining property (3 High Street) dated 1767 that this messuage on the south side of that property was owned and occupied by John Rudge. The 1775 land tax record shows John as the owner of the property still being referred to as ‘for Cookseys’ which is surprising as it is almost 40 years since the Cookseys were associated with the property. John died intestate, but we know that following his death, his widow, Mary, continued to own the property. She is listed as the owner in the 1780 and 1781 land tax records when the property was let to Misses Waggstaff. By 1782 these ladies had moved to Castle Street as tenants of Elizabeth Crowther and from 1782 to 1784 Mrs Rudge was shown as the owner and occupant of the property at 5 High Street. In her last will and testament dated 22nd August 1788 she left the freehold house where she was living to her cousin, Nathaniel Adams Bartlett of Kington, yeoman. (She also left Nathaniel several closes of land in Morton). We can’t be sure that she was still living in 5 High Street at the time she wrote the will. Mary died in 1789 and her will was proved on 30th July 1789. John Edmonds – the land tax records of 1796, 1797 and 1800 show that John Edmonds was the owner and occupant of 5 High Street. John Edmonds was living at 7 High Street in 1792 at that time that the owner of that property, George Rolph, wrote his will. On the 15th April 1792 John married Mary Child. Mary had been baptised on 16th January 1760, the daughter of Thomas and Ann Child. John was a cooper. We know from John’s will dated 1808 that John and Mary lived in 5 High Street owned by his wife, Mary. We assume that Mary had inherited it, possibly though her Child connections. The will also shows that John had recently purchased the house next door to this house from Thomas Rolph and converted into into two houses now known as 3 and 3A High Street. John also owned property at 59/61 St Mary Street. The land tax records show that Mary was the owner and occupant of the property at 5 High Street in 1809 and that in 1812 and 1814 she was renting it to Samuel Penduck. The land tax records of 1819 to 1832 show Mary again as the owner and occupant of the property. She died aged 75 and was buried on 17th January 1833. Parslow and Rolph – the 1840 Tithe Survey shows the property as Plot 198 a house and yard owned by Joseph Parslow and William Rolph and occupied by Edwin John Quarrington (see below). Joseph and William were partners in the bank which was located at 11 High Street. We don’t know when or why they acquired this property. They let it out to tenants. The last will and testament of James Elliott dated 1855 who had been a tenant in the property since 1839 shows that he had just agreed to purchase the property from William Rolph and Francis Yates. At that time he had agreed a purchase price of £550 but only made apart payment of £50. He left it to his wife to pay the rest of the money owed. It seems to have taken her a few years to complete the payment as the property was still being listed as owned by ‘Harwood & Co’ in the rate books of 1859 and 1862. The 1867 Rate book shows ‘Mrs Elliott’ as owner. Edwin John Quarrington – was listed as the occupant in the 1840 Tithe Survey, even though he had died two years earlier! Edwin was the youngest son of William Quarrington of Waterloo Wharf in Newbury, Berkshire. We have been contacted by a descendant of the Quarringtons who was able to purchase a 28 page booklet called ‘Memoir of E. J. Quarrington, late of Thornbury.’ This was published in 1839 after his death. It was written by a friend at the request of the minister who preached at his funeral service. We understand the booklet is held by the Bodleian Library and a microfiche copy held at Chicago Public Library. We have been told that this booklet shows that he moved from Newbury to Thornbury to take up an apprenticeship when he was 14. Edwin first spoke to children of the Wesleyan Methodist Church in Thornbury in August 1828 and he soon became a permanent Sunday School teacher there. He became a local preacher about December 1831. After his apprenticeship expired he moved to Cheltenham and preached in that circuit on Sundays. He returned to Thornbury around 1836. He was mentioned as being a draper in a record of the Workhouse dated 11th August 1837 when an inmate, Fanny Stephens was placed with Edwin as a servant. On 21st October 1837 Edwin married Mary Ann Fowler of Frampton Cotterell. The marriage took place at St Peters Church, Frampton Cotterell. The marriage record shows Mary Ann’s father was Luke Fowler. Edwin and Mary Ann had a son, Edwin Fowler Quarrington baptised in Downend on 3rd February 1839. A newspaper article in the Bristol Mercury dated August 3rd 1839 says that Edwin died on 25th July at Thornbury after a few days illness. We understand that the booklet says that he gave his last sermon at Almondsbury on 7th July 1839 when he got wet on the way home and caught a severe cold. He died 18 days later. Apparently his death certificate says that he died of Typhus Fever. The 1841 census shows Mary Ann and her young son, Edwin, returned to live in Frampton Cotterell with her father who was a hatter. The 1851 census shows she had moved to Lincoln and she died in Grantham on 4th June 1881 having never re-married. The probate record shows her son had become a vicar in Grantham and he was the executor of her will. Edwin Fowler had studied at St Catharines College Cambridge in 1859. He had married Penelope Helen Keene in Leamington Priors in 1872. He died on 3rd September 1922. The probate record shows he was living in Esher House, Woodhall Spa, Lincolnshire. Mary Ann Quarrington spinster was his executor. We suspect the entries in the rate books for 1859 to 1867 to be misleading. The two properties owned by ‘Harwood & Co’ are grouped together giving the impression that they might be 9 and 11 High Street. 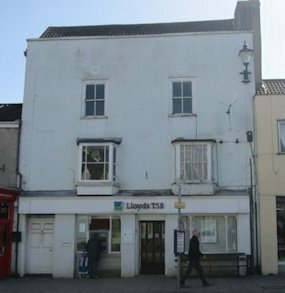 We had great difficulty matching the owners and occupiers of these two properties on the basis of them being 9 and 11 High Street. We concluded that ‘Harwood & Co’ as the name of the partnership running the bank were owners of the same properties associated with ‘Joseph Parslow and William Rolph’ in the 1840 Tithe Survey and thus they were in fact 5 High Street and 11 High Street. The Elliotts – we suspect that James Elliott took over the drapery business following the death of Edwin Quarrington in 1839. The trade directories from 1839 to 1856 show that James was a linen and woollen draper, silk mercer, haberdasher, glover and laceman. He was also an agent for for life insurance and fire and office agent for Great Britain Mutual Life. The 1841 census shows James and his wife Ann were staying with James’s father, also called James Elliott, at his home in Biddlestone St Nicholas in Wiltshire. James was a draper aged 35 and Ann was also a draper aged 30. They had one daughter with them: Louisa, aged 3. Both Ann and Louisa were born outside of Wiltshire. It is interesting to see that James and Ann’s other children were listed as being in Thornbury. George aged 11, James aged 6 months and Ann aged 10 are listed as living at 5 High Street. There are no family members there to look after them, but there were other adults there: three apprentice drapers, James Harding aged 25, George Taylor aged 15 and Edward Poole aged 15 and also an independent lady called Martha Rider aged 20 and two servants, Eliza Savery and Harriett Trayhurn, both aged 15. James Elliott married Ann Rider in Bristol on 20th November 1828. We feel confident in this assumption because the 1861 census shows that their daughter, Mary was given the middle name ‘Rider’ and they had a Martha Rider looking after three of their children whilst their parents were visiting James’s father in 1841. We assume that Martha was Ann’s sister. The 1851 census shows James and Ann settled in 5 High Street with their children. James was described as a draper and registrar of marriages aged 44 and born in Biddlestone, Wiltshire. Ann was aged 40 and born in Bristol. They had seven children: George an assistant draper aged 21 born in Bath, Mary A aged 18 and Louisa aged 13, both described as ‘At Home’ and both born in Bristol, James aged 10, Joseph aged 8, Maria aged 6 and John aged 4, all born in Thornbury. The family had two servants: Emma Bennett a house servant aged 21 from Oldbury and Mary Trayhurn a nurse aged 15 from Thornbury. The records of the Congregational Church of Thornbury show that Maria Catherine was born on 5th October 1844 and John was born on 4th February 1847. Both were baptised there on 18th March 1849. The thumbnail image shown on the right is a billhead dated 1844 for James’s business. Click on the thumbnail to see a larger image. Note the name on the billhead appears to show ‘I. Elliott’. This describes the business as a ‘Scotch and Manchester Warehouse’, ‘Wholesale and Retail Linen and Woollen Draper, Silk Mercer, Hosier and Haberdasher and Glover and Laceman’. He was an importer of Irish Linen and sold ‘Gentleman’s fine London hats and caps of every description’, ‘a General Assortment of Ready Made Clothes’ and he specialised in ‘Family Mourning – funerals completely furnished’. James died in 1855. He wrote his will on 3rd February 1850 in which arranged for his wife, Ann, to enjoy the benefit of any rent, income or profits from James’s unspecified property during her lifetime, and then after her decease the profits to be divided between James’s children. In a second codicil written on 3rd August 1855, he added that he had on 16th March 1855 agreed to buy the property at 5 High Street from William Rolph and Francis Yates. The price agreed was £550 and James had already paid them £50 in part payment. The property was also to be left to Ann subject to her paying the balance of the purchase money from her own monies without effecting his desire to leave his assets eventually to his children. We don’t know when the purchase of the property by Ann Elliott was completed. The 1859 and 1862 Rate Book still show ‘Harwood and Co.’ to be the owners, but by 1867 Rate Book ‘Mrs Elliott’ is shown as the owner. The 1859 Rate Book shows Ann was still living in the High Street as a tenant of Harwood and Co. By the 1861 census Ann had moved to Bristol where she was living at 7 Dean Street, St. Pauls with her daughters, Ann E who was a schoolmistress aged 30 and Louisa who was aged 23. The 1861 census shows that Ann’s son, George Elliott, had taken over the shop and business at 5 High Street from his mother. George had married Esther Louisa Lane in the Bristol area in 1858. The census shows George Fryer Elliott was a draper aged 31 born in Bath. He was living there with his wife, Esther L aged 31 born in Thornbury and his sister, Mary Rider Elliott aged 22 born in Bristol. The records of the Congregational Church in Thornbury (now known as the United Reformed Church) show that in 1861 George Elliott got leave to place an organ in the Chapel ‘at his own expense’. The bellows of this organ blew up one Sunday following a faulty board. George was still being listed as the tenant of Harwood & co in the 1862 Rate Book, but by 1867 Rate Book he had moved elsewhere. The 1867 Rate Book shows ‘Mrs Elliott’ as the owner of the property, then being let out to Henry Barrett. The 1871 census shows Ann had moved to 3 West Grove, Westbury on Trym. She was now living with four of her children. They appear to be running a school from the premises as three daughters, Ann Mary and Maria were all teachers and four pupils were living with them. Ann’s son, Joseph was an assistant grocer. Ann died at Fairfield, Cotham Park in Bristol on 5th October 1873. She was aged 64. We don’t know where George or his wife were in the 1871 census, but by the 1881 census they were both living at 1 Ashley Hill Villas, Old Ashley Hill, Bristol. George was an accountant’s clerk. George died on 11th November 1886. The probate record describes him as ‘late of Thornbury draper, but since of 1 Ashley Hill Terrace, Bristol accountant’. The 1891 census shows Esther boarding at 6 Westbourne Place, Clifton. She was described as ‘living on her own means’ aged 61. In 1901 she was boarding in a four room apartment at 17 Arlington Villas Clifton. Interestingly she was noted as being aged 60! She died on 4th February 1909 aged 78. The probate record shows her address as being 12 Richmond Terrace, Clifton. Her executor was George Whitfield, miller. The Barretts – Henry Barrett was a draper. The 1861 census shows he and his wife, Harriett, were living in Victoria House, High Street, Highworth. Henry was aged 42 and born in Highworth, Wiltshire. Harriett was aged 37 born in Chiveley, Berkshire. They were living there with their children, Julia H aged 11, Francis W aged 2 and Ernest H aged 1. The 1867 Rate Book shows that they had moved to Thornbury and were living at 5 High Street which Henry was renting from Mrs Elliott (see above). The 1869 and 1871 Rate Books show that Henry Barrett also show them occupying the shop. We are lucky to have an old photo of the street showing the Barrett shop there. An extract of this photo showing the Barrett shop is shown at the top of this page. We assume that it was Henry Barrett who gave the shop the name of Victoria House which was the name of his previous shop in Highworth. In March quarter 1871, Julia Harriett Barrett married John Hodges Williams in the Clifton area of Bristol. The 1871 census shows that the Barretts had moved away and John and Julia Williams had moved into their house/shop. Julia’s brother, Arthur E Barrett aged 6 was living with them as well as a draper’s assistant, Alice Rock and a servant, Clara Hopkins. We don’t know where Henry and Harriett were in the 1871 census. In 1881 Henry and Harriett Barrett were living at 6 James Street, Weston Super Mare. Their grandson, John Williams aged 9 was living with them. Henry died on 11th May 1884 at 6 James Street, Weston Super Mare. The Williams – the 1871 census shows John Hodges Williams was living at 5 High Street. He was a draper aged 18 living with with his wife, Julia aged 21. Julia was the daughter of Henry and Harriett Barrett who had lived in the property previously (see above). The 1876 Rate Book shows that the property was owned by John’s father, John Williams, the tailor who lived at Gloucester House in Gloucester Road. The 1880 Rate Book shows John Hodges Williams was now the owner and occupant of the property. Thornbury Men’s Club – in 1920 the ‘Thornbury & District Mens Club’ was founded. Its original purpose was to benefit of ex-servicemen, but it was later extended to cover a wide range of local inhabitants. John Hodges Williams continued to own the property throughout this period. An article printed in the Gazette in 1923 reported that the Club had achieved the object for which it had been opened and was doing good, particularly amongst the younger men of the town and district. Officers of the Club elected for the new year were: President, Major A.H.S. Howard M.C., chairman J.G. Wicks, hon secretary A.C. Pitcher, hon. treasurer H. Talbot, committee G.B. Symes, A.R. Trayhurn, J. Pavey, A.C. Huins, A.E. Thompson, F.W. Davis and G. Hall. The electoral registers from 1946 to 1958 list Henry and Violet Rugman, Edwin Hodder Ryder and Elizabeth Ann Ryder and then W.C. and Theresa M Miles as living there. J. Tucker – the programme for the 1961 Thornbury Flower Show has an advertisement for J Tucker of 5 High Street selling groceries and provisions. We do note that there was a couple called Victor and Joan Tucker living at 2 High Street at this time. However at this point we have no further information. Leslie never lived at the shop. His home was in Rudgeway and we understand that the accommodation above the shop was let out as flats. Cyril and Betty Lambert lived in one flat throughout this period. Betty worked in Leslie’s shop. The 1965 electoral register lists Francis J and Joyce E Benstead as living in one flat and Gillian S Hull was living with the Lamberts in the other. She was Betty Lambert’s daughter from her first marriage. The 1970 electoral register lists Philippa Duncan and Judith Sayers in one flat and Cyril and Betty Lambert in the other. In more recent times, the property has been used as a bank, initially by the Midland Bank and then, when the Midland Bank moved to 23 High Street, Lloyds Bank moved in to replace it.